The conversation around mental health has changed in the last decade thanks to awareness raising campaigns that flood our airwaves and social media feeds seeking to normalize mental health issues while advocating for better treatment options and increased services. Awareness campaigns and hashtag days have made inroads into destigmatizing mental health issues, a cultural shift towards understanding that mental health is health. 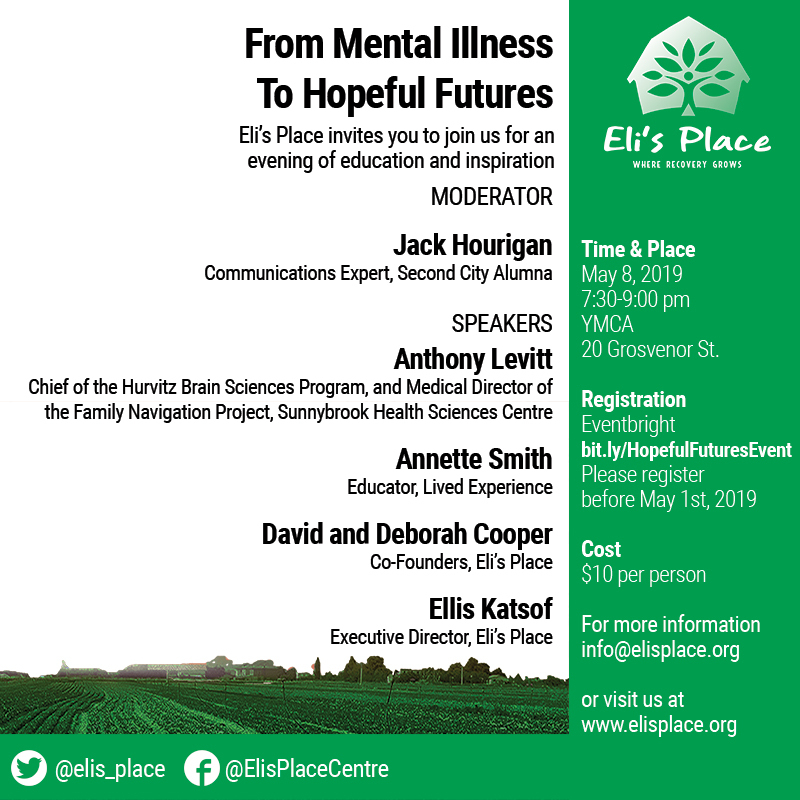 Join our guest speakers on Wednesday, May 8 for an evening of information and inspiration as we explore a new model for treating mental illness. Speakers will discuss the current mental health services available, both hospital and community-based, from professional and personal perspectives. 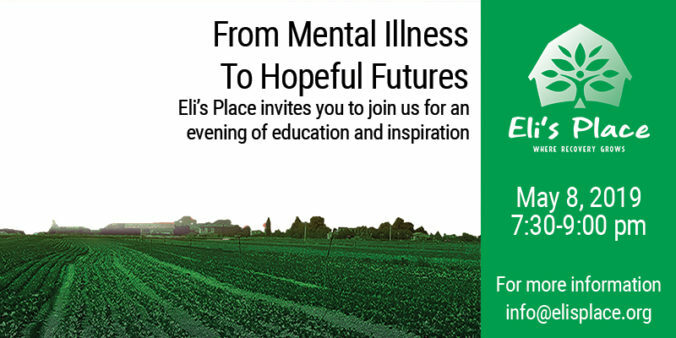 The audience will be introduced to Eli’s Place, which will be Canada’s first long term rural residential treatment centre for emerging adults with mental illness – and learn about the benefits of applying the recovery model in treatment. Tickets to the event can be reserved online here. A McGill University and Second City Alumna, Jack is a professionally trained improviser, writer and television host with more than 20 years experience in the communications field. Jack’s unique brand of humour, positivity and openness creates safe spaces to explore ideas. Currently she is a Principal with Sway Partners. Jack’s peer support experience includes Parent Partner at Mount Sinai Hospital and online peer support facilitation for the CPBF (Canadian Premature Babies Foundation). Jack currently works with the CIHR award winning #itdoesnthavetohurt pain management education initiative for kids. Jack regularly hosts conferences and panels combining her lived experience with her communications expertise to integrate teams, bring awareness and enhance healthcare delivery. Dr. Levitt has had a distinguished career in psychiatry with appointments at CAMH, McMaster University and Sunnybrook Health Sciences Centre. Currently, Dr. Levitt is Chief of the Hurvitz Brain Sciences Program and Medical Director of the Family Navigation Project at Sunnybrook Health Sciences Centre and is a Professor of Psychiatry at the University of Toronto. In over 160 peer reviewed manuscripts, Dr. Levitt’s research and clinical practice have centred on treatment-resistant mood and anxiety disorders with a focus on clinical trials. Facilitating patient and family access to care within complex mental health and addictions systems is the focus of his work as Director of The Family Navigation Project, a not-for-profit program that helps to identify mental health and addictions resources for families with youth 13-26. Annette Smith has degrees in Physical Anthropology, Education, Early Childhood Education and Educational Technology. She has worked in a variety of educational roles ranging from a kindergarten teacher to the registrar at a graduate school. Currently, she provides administrative support and IT training at the Adler Graduate Professional School. With 25 years of lived experience in the mental health system, Annette provides valuable support to Eli’s Place. Always willing to share her insight and expertise, Annette feels strongly about speaking as an advocate for people in the mental health system. She has provided peer support and presented talks from the perspective of lived experience for professionals in the mental health system. As Eli’s parents, Deborah and David are founding Directors of the Eli’s Place Board. They are the authors of Bridge Over The River Why, in which they share practical supportive advice for bereaved parents who have lost a child to suicide and the professionals who work with them. An active community volunteer for more than 45 years, Deborah Cooper is a retired Public Health Nurse with the City of Toronto. She later worked with David in the family business for almost 30 years. In addition to serving on the Board, Deborah is engaged with a variety of committees within the Eli’s Place organization. A retired business owner, David is very active as a volunteer grief facilitator with the Toronto Distress Centre. In 2003 he received the Peter F. Drucker Award for Not-For-Profit Innovation and later received the New Spirit of Community Award at the Canadian Centre for Philanthropy. David is Chair of the Eli’s Place Board of Directors. With a degree in social work, Ellis has had a successful and varied career in social services. He has a proven track record in development of innovative mental health programs and social enterprise initiatives. Ellis is sought after as a speaker and consultant. He was a Rotarian from 2005 to 2019 and is a Paul Harris Fellow. A highly accomplished, results-oriented, decisive leader with 38 years proven success in strategic thinking and innovation, Ellis’ goal, as Executive Director, is to move Eli’s Place from an exciting concept to a fully operational program. Space is limited – reserve your tickets online here!